There was a point in time where Tedford seriously considered bolting for another job. Those opportunities came early during the Tedford era, fresh off of Cal’s most impressive season to date in 2004. However, one of the main reasons why a lot of Old and Young Blues alike have an adoring respect for Tedford has been because of the coach’s loyalty to the program and his desire to not only win, but win at Cal. So it turns out that Saturday will be Coach Tedford’s 100th game. This is a nice article about the change Tedford’s made at Cal — not only in terms of making the football program a winner, but for his part in turning boys into men. 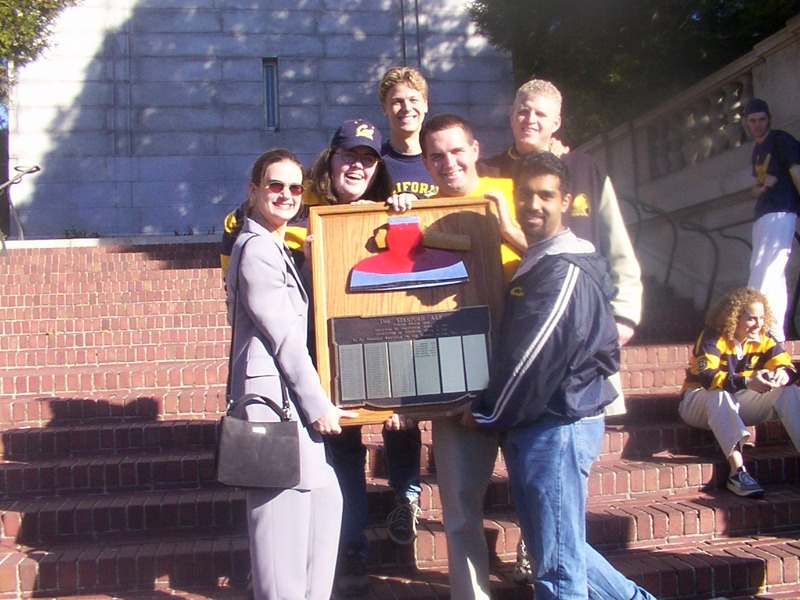 My undergraduate career at Cal was the football seasons from 1996 to 1999. In those four seasons, Cal went a depressing 18-27. We made it to one bowl my freshman year (which we lost to Navy), we never won the Big Game, and we were pretty much the conference doormat. We also cheated, and rightfully got slapped for it, but it’s not like we could even cheat right — the point of cheating is to win, no? Anyway, the highlights, which were few, were beating Oklahoma twice (although those OK teams weren’t very good) and taking three of four from USC — but they weren’t very good at the time either. Then, it culminated in the disaster of 2001, where my beloved Bears went 1-10. Okay, I admit, by the end of it, I was idly rooting for a “perfect” season, but we managed a win in the last game of the season, a postponed-by-9/11 game with Rutgers in New Jersey. I still maintain that if we’d played Rutgers when scheduled, we’d have won that game and gained the confidence to take a couple over the course of the year, but I can’t prove it, and if it had worked out that way, then it might not have lead to something good. The good, in this case, was the fact that we managed to convince the offensive coordinator from an Oregon Ducks team that really should have played in the National Championship that year to come to Cal and be our head coach — a dude named Jeff Tedford. Tedford said that from the beginning, he wanted to change the football culture at Cal. And when, that first season, my first year as a grad student at Cal, I was in the stadium to watch Cal completely blow the Baylor Bears out of the water 70-22, and when the first Cal play from scrimmage went for a touchdown, I began to believe again. When we went 7-5 with the same players that had gone 1-10 the year before, and would have gone to a bowl if it wasn’t for the aforementioned cheating, things got a bit better. Of course, the greatest thing was finally seeing a Big Game victory — the first Big Game victory for Cal since I was a junior in high school. Being a Cal fan’s a hard thing. My Bears are pretty much the Chicago Cubs of college football. The last time we went to a Rose Bowl was in 1959, and Cal fans start every year with the high hopes that this will be the year in which we go to the fabled promised land of Pasadena, California for New Year’s Day. And year after year, the hopes turn frail and bitter as the Bears inevitably find ways to lose games they shouldn’t, or have the unfortunate luck to get good just as USC is putting together a dynasty for the ages. But get rid of Tedford? Are you kidding me? He’s 66-33 overall. That’s a pretty good winning percentage — and he’s done it at Cal, where the institutional support is always going to be somewhat lacking. Sure, we haven’t made it to the Rose Bowl yet, but on the other hand, I actually believe that we will go someday. And we’ll go with Tedford as our coach. I mean, I finally actually got to touch the Axe, right? I gotta believe. Anyway, I need eight more donations of ten dollars each to get to The Night of Writing Dangerously, thanks to a few awesome friends. Can you help by donating? 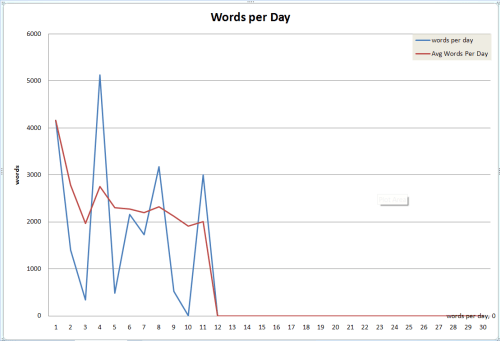 The blue line is my wordcount per day, the red line is the rolling average. Yeah, it’s very choppy. But I’m writing! I just passed 22k! I keep trucking! I need to go back and add yesterday’s server-maintenance delayed post, but it will be up. Meanwhile, today, I’m giving you an excerpt from my novel-in-progress. Help me get to the Night of Writing Dangerously! I only need about 16 more people to throw $10 at the pot! Anyway, this is told from the point of view of a reporter character who is doing a series on a Congressman and would-be presidential candidate, and in this bit, goes to interview the Congressman’s son. This entry exists merely to meet the letter of the challenge. It probably doesn’t meet the spirit, but since the last three days’ entries have seemed to be on the negative side and nobody wants to read that crap. So, I’m going to spare you all another rendition. It’s November. It’s supposed to be my best month. And it isn’t. And nobody cares. In regards to point #3, it did that job well, as looking at my mailspool showed me that last night’s post had been hit by several spammers overnight. I don’t know why Akismet failed so badly, but it leaves me in a bit of a dilemma. I want to leave trackbacks on so that I can see when blogs are linking me, but most of the spam that gets through the defenses is trackback spam. And I really wasn’t overly happy clearing out that mess today. Anyway, it’s just a point. Spammers are lower than scum and will be the first against the wall when the revolution comes. If you haven’t guessed, it’s not only NaNoWriMo month, but because I am absolutely totally and completely out of my gourd, I’m also doing Blog Posting Month. So that means one a day of these things every day in November. Of course, I could cheat and give you my cumulative word count every day, but that hardly seems fair. So I’ll guess I’ll turn this over to those of you that actually read this thing on a regular basis. What would you like me to address? I could use some ideas for days when I can’t come up with my own. Feel free to drop them in comments. As I mentioned before, I’m doing NaNoWriMo this year, like I do every year. And the last couple years, they’ve been doing a fundraising event called the Night of Writing Dangerously over in the Bay Area. This year’s event is the night after my birthday (yep, November kid) and I’d kind of like to go this year. Especially since the other November event in the Bay Area I’d like to attend is at the Breadbox Stanford this year, and tickets will be impossible because Stanford’s capacity has shrunk majorly. The problem with going to the Night of Writing Dangerously is that I need to come up with $200 as a donation. Now, I’m all for giving money to the folks at NaNo HQ, because they do some marvelous work at encouraging people to write (particularly kids – I love their Young Writers Program). Also, they make my life easier when it comes to organizing the region. But, $200 is out of my range this year. So this is where I turn to y’all. If any of you wants to (note that you do not have to, these are hard times for everybody and I’m doing this as a longshot), I’d love for you to donate some money to NaNo so that I can go. So if you want to help, you can donate here. If you do, I appreciate it. If you can’t, well, I understand. These are hard times. It would be nice to go, though. Anyway, word count is at 5703; am going to try to get to 6000 before I got to bed tonight. Other than that, nothing exciting is going on. So it’s November. November means it’s NaNoWriMo month, which means that I’m running around like a crazy person. Then I stupidly said, “Ah why not, I’ll update my blog every day this month. It’s not like I don’t have enough to do.” Since I’m sure there’s folks out there that want to keep me honest, guess I’d better get the month started. But the combination of staying up way late for write-in, and then getting up way early for the morning write-in, alongside the timechange, is just making my brain go *splat*. And since that means I’m not coherent, that means it should be bedtime. But I have nearly four thousand words, and I saw a nice sunset. It was a good day.